HEMP SEED OIL (raw) - Edible - Premium Quality! GOOD FOR YOUR HEALTH! BACK-IN-STOCK! PRICE: C$18.99 - 240 mL - 8.0 fl.oz. PRICE: C$9.50 - 120 ml - 4.0 fl.oz. PRICE: C$4.99 - 60 ml - 2.0 fl.oz. CANADA/TAX FREE - FOOD ITEM. Product of our Canadian Prairies... Global leaders in Hemp Food & Oil products! No Pesticides - No Preservatives - No Additives - Contains No GMO's! GROWN SUSTAINABLY IN THE CANADIAN PRAIRIES - WITHOUT THE USE OF HERBICIDES OR PESTICIDES! SUITABLE FOR LIFE LONG CONSUMPTION! Use 1 to 2 Tablespoons - taken daily for life! This oil has a green colour with a gourmet nutty flavour. A tasteful compliment to a variety of foods. It can be added to juices, smoothies, soups, sauces, and salads... Creating a rich creamy texture. 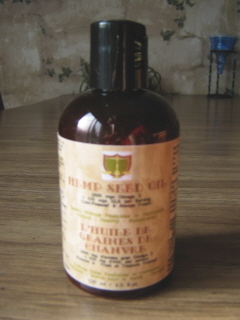 Hemp Seed Oil is an excellent base for any type of salad dressing! You can substitute Hemp Seed Oil for other Oils in recipes that are NOT HEATED ABOVE 176C (350F degrees). Heating above this temperature will destroy its nutritive qualities! No parabens or petroleum based additives. Gluten free - Phthalate free - THC free - Petroleum by products free!